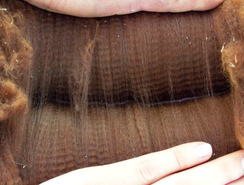 Super Fine and Dense Fleece! 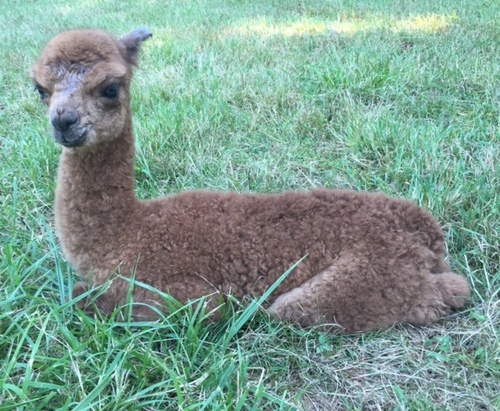 2015 Femal Cria 1 Day Old! JLFA Michelangelo’s Peruvian Pandora is a FULL PERUVIAN, ½ ACCOYO, MEDIUM ROSE GREY female that will be an asset to ANY breeding program! Check out her fleece! Miraculous! Pandora has blinding brightness, tight tiny crimps, amazing consistency, wonderful handle, and extreme staple length, not to mention phenomenal fineness and density. Her conformation is also terrific - well balanced with excellent proportions and straight lines. One look at her and you can tell she is an exceptional “Mike” kid! It is by no accident that this ribbon wining show gal is so impressive. Her sire is the one and only El Nino’s Accoyo Michelangelo who is a multi champion light fawn El Nino son. El Nino is arguably the very best Caligula son to exist and Mike is arguably the very best El Nino son to exist. 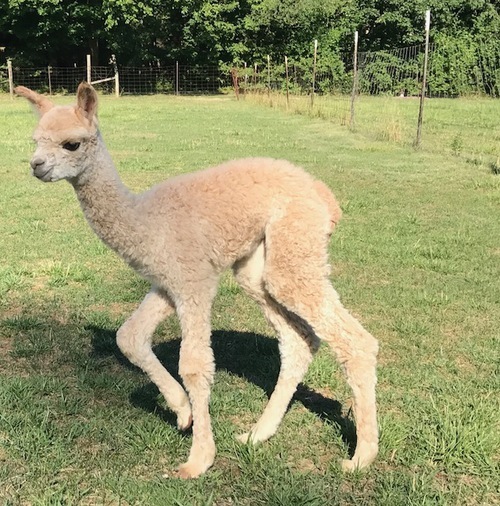 He is remarkable in every way – proven through his awards and progeny – many of which have become multi champions or “not for sale” foundation alpacas for so many farms. Mike had a skin biopsy by Dr. Norm Evans that showed 115 follicles/sqmm! 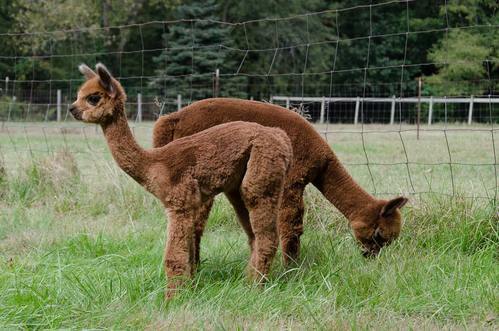 That is density that not another alpaca tested has come close to achieving – oh – and he passes this trait to his offspring. With extreme density comes fineness and boy does he have that, as well as consistency – you would be hard pressed to find primaries on this boy. Pandora’s dam is JLFA Luciano’s Peruvian Paloma, a MRG show gal who placed 9 times for top tiered ribbons, including 3 blues! Paloma is a fabulous mother who consistently produces show offspring year after year – 75% of which are FEMALE. Paloma is an El R Peruvian Luciano daughter. He is a legendary grey male sired by Peruvian Platinum, a LSG Peruvian Import. Paloma’s dam is a DSG (3rd generation) gal who has made 100% FEMALE offspring, and more than 80% are black or grey! The Luciano/Michelangelo genetic cross is proven success. Pandora’s full sister is JLFA Michelangelo’s Peruvian Panthia, who is a 16x BLUE and 14x BANNER winning gal. UPDATE 7-29-2017 - Pandora delivered another beauty! This time a Light Fawn Female! You can see the little bundles and fell the density! No surprise consider her lineage. He full sister is a multiple blue ribbon winner and reserve champion. 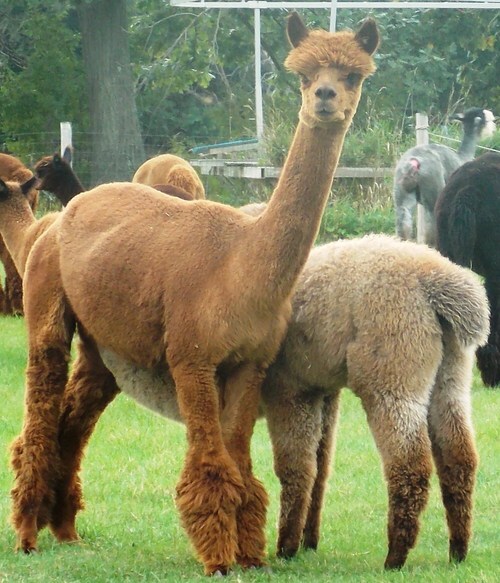 Pandora has been bred to JLFA Ventura for a 2019 cria.